Anyone reading this blog has probably wondered where I’ve been. It’s been almost an entire year since I posted. I intend to keep this blog active now that some other projects have developed enough that they are not consuming all of my time. Here’s a recap of what’s been going on since my last post. I’ve been working quite a bit in the realm of virtual worlds and education. A conversation with others in the field brought up the point that there is a serious dearth of venues for publication of research in this area. A colleague, David Pascal, suggested we create our own peer reviewed journal. The wheels started turning, and I suggested we create an umbrella organization that would allow us to create other journals and publications in the field as they become necessary. A year ago today, the Center for Virtual Worlds Education and Research, Inc. filed articles of incorporation. 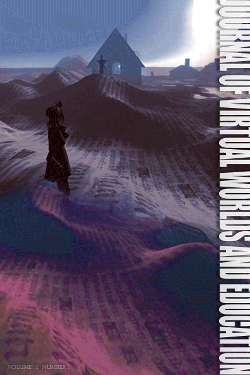 We began our effort to pull together experts in the field to start our first journal, The Journal of Virtual Worlds and Education. I made a trip to Monterey Bay, California to attend the New Media Consortium’s Summer Conference. I learned an enormous amount about the changing face of education — not just in virtual worlds, but in all aspects of new media. Digital storytelling was a big topic at the conference. Virtual worlds and Facebook were topics. Challenge based learning was an eye-opener. I met some wonderful people who are working hard and working creatively to change the way education gets done. Shortly after returning from this trip, we gathered up our editorial team and put out a call for papers. Our editorial team is currently comprised of faculty members from Rochester Institute of Technology, University of Rochester, St. John Fisher College, and University of Nevada, Las Vegas. By the time we reached our November deadline, we had several excellent papers in hand. We sent them out for blind review and have just received them back. Now the editorial process begins, and we are planning for a May publication date. This has taken up the bulk of my time in the past year. I have also been participating in Urgent Evoke. It’s an online social game created by Jane McGonigal for the World Bank to bring people together to solve very big problems. I continue to work in Second Life, maintaining a small parcel which I have used for both CVWER and for my real life library system, where I held a Big Read discussion of Call of the Wild last month. I continue to be impressed by the librarians working in Second Life who maintain their real life jobs as well as their virtual world reference services and events. Recently, Marilyn Johnson, author of This Book is Overdue: How Librarians and Cybrarians Can Save us All, was in Second Life for a visit with the CVL group. It’s nice when someone outside the group “gets” what is being done by the in-world librarians.